This is just a cute graphic I found – “Broken.” I think these guys are Paleo diet, who took the refined carbohydrates off the bottom of the chips and sweets off the top. 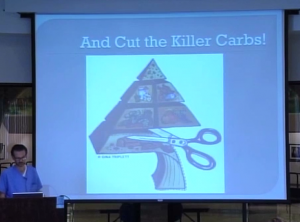 And I like this graphic too – “Cut the Killer Carbs.” Everything on the bottom of the food pyramid is refined, packaged, processed, high carb and low nutritional value. They fortify the stuff – have you ever heard of fortified flour? They fortify the flour with B vitamins because it’s got no B vitamins in it. Right? And basically in the cereal box, they sell you $0.04 of raw materials for $4. One thing the food pyramid got right – sugar. Sugar is a refined carbohydrate and it will increase your weight. This is the Atkins food pyramid, and this is kind of what a healthy diet – there’s a lot of meat on the bottom, fish and eggs, you have all the green leafy vegetables you want, certain fruits you can have all you want of, other fruits you have to kind of limit, then nuts, and if you’re gonna have any carbohydrates, any refined carbohydrates, they’re at the top. And you have to find something that works for you because this is another food pyramid and this food pyramid says, “Look, a whole bunch of green leafy vegetables is the best thing I can eat.” And if that’s a paradigm, if that’s a paradigm in your mind, you can’t get past that, then just do it like that. Do it like that, as long as you move the refined carbs somewhere up to the top – those potatoes and refined carbs right there – as long as you move them up toward the top you’re gonna do alright. That’s a more balanced diet. And this is how the Atkins diet is portrayed, this is Dr. Atkins, and it’s fish and fish and steak and turkey and I don’t know what that other thing is. You see, there’s just one little sprig of broccoli. But really, I never knew what the Atkins diet was until after I lost weight and I read his books because I was trying to figure out why it worked. And in his book, you replace the breads and cereals and grains, you replace those carbs with vegetables. And so they portray it as, “Oh, it’s meat and cheese and meat and bacon, that can’t be healthy for you.” In reality, it’s more like this – there’s a lot of vegetables, fruits, vegetables, vegetables, and then there’s meat and there’s some vegetables, there’s meat in here, so really, I’m not preaching a diet that’s just meat and cheese and meat and bacon and cheese. All I’m saying is you replace the carbohydrates with vegetables. Meat contains all the amino acids necessary to life, all the essential fats necessary to life and 12 of the 13 essential vitamins except vitamin C. Meat contains B12 and vitamin D and they’re only found in meat. So you’re not gonna get a vitamin deficiency. The more refined carbohydrates you eat, the more B vitamins and C vitamins you need. 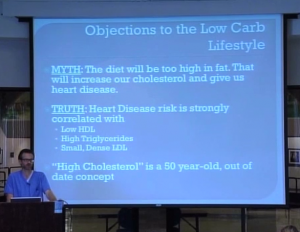 Here’s a myth that the diet will be too high in fat and will ruin my cholesterol, we talked bout that. Your cholesterol is going to improve. These are the risks for heart disease and you can’t change your age but down toward the bottom, there’s hypercholesterolemia which is high cholesterol, there’s low HDL and high triglycerides. And those things are gonna improve on this diet. There’s also a bunch of other things, we talked about inflammation. CRP fibrinogen and homocysteine are measures of inflammation and these things improve when you get rid of the wheat and you get rid of the carbs. Myth: I won’t get enough fiber. You’re gonna get plenty of fiber ’cause you’re gonna get your fiber from fruits, vegetables and nuts. You don’t need the fiber that’s in healthy whole grains. Whole grain or wheat bread is just a low-tar version of white bread. Because it’s low tar it doesn’t mean you should eat a lot of it. Low-tar cigarettes, you should avoid just like high tar cigarettes. 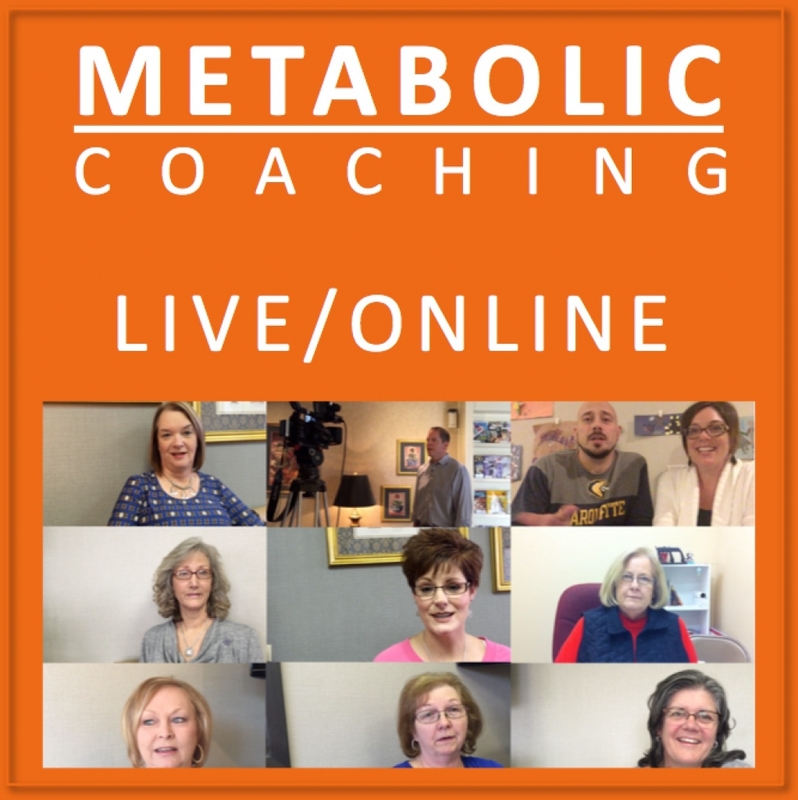 Vitamin Deficiency and Ketone Issues? “I won’t get my folic acid and B vitamins.” Flour’s enriched because it doesn’t contain any of them. Nuts and animal products contain all of the vitamins you’re gonna need except for vitamin C. I recommend you take a multivitamin. What if you get some sort of other dietary deficiency? There’s no such thing as a refined carbohydrate deficiency syndrome. If there were a refined carbohydrate deficiency syndrome it would be defined as: the patient is slender, he has high HDL good cholesterol and low small LDL bad cholesterol, and low triglycerides; the patient has a flat stomach, normal bowel function, and blood pressure and blood sugar, and is healthy. And the truth is, people who just cut the wheat out of their diet and don’t do anything else they eat 350 to 400 fewer calories a day. So cutting the wheat is a worthwhile investment. 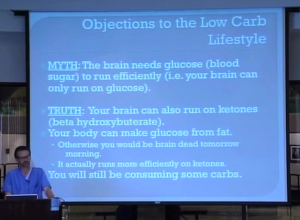 There’s a myth that your brain needs glucose, it can only run on glucose, and the truth is that your brain, number one, can run on ketones, and it runs actually more efficiently on ketones. That’s why ketones have been used to treat Alzheimer’s disease and epilepsy and even improve the symptoms of schizophrenics – ketogenic diets which are low carb diets. Number two, your liver can use the fat to produce glucose so you’re not gonna have a glucose deficiency that causes you to go brain dead. 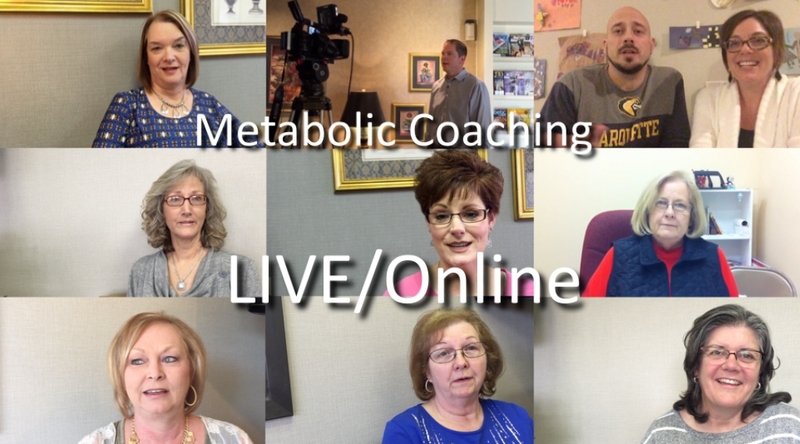 Number one and number two – you can use the glucose from fat and your brain can run on ketones. Now if your brain couldn’t run on ketones you would be brain dead in the morning. Because every single night, your body runs on ketones. I showed you that graph where the blood sugar skyrockets and then two or three hours later it goes down. And then it kind of levels out. It levels out because the rest of the sugar is coming from your liver, it’s coming from the fat that you’re burning and you’re actually burning ketones as you go along through the night. It’s perfectly safe. Oh, and number three, on the diet you still consume carbohydrates, but you’re not consuming refined carbohydrates. So you don’t have to worry about your brain not having enough sugar.